Cette position sera utilisée pour Le Tournoi Thématique du mois de mai 2005, voir là-bas tous les renseignements sur cette variante. Arion 1.3 et Delphil 1.4 participent à ce tournoi en tant qu'invités. Diablo 0.3 gagne assez facilement ce tournoi devant Queen 3.04. Adam 2.8a, pour sa dernière sortie, engrange une belle troisième place. Delphil 1.4 se place au milieu du tableau. Matheus 2.3 et Tornado 0.80.17beta ont du mal à suivre le rythme. Victoire surprise de Muse 0.899b qui avant ce tournoi se situait à la fin du classement de la Division. Frenzee 200 remporte un tournoi où les anciens se réveillent, en particulier Abrok 5.0. Terra 3.4 passe complètement à côté et Ufim 6.00 est un peu décevant. Little Goliath remporte le tournoi d'un demi-point devant Zappa 1.0. Pepito v1.59 et, surtout, Amyan 1.595 ne sont pas des fervents de tournois thématiques. Spike 0.9 confirme une nouvelle fois ses ambitions et remporte facilement ce tournoi sans aucune défaite. La surprise vient de Tao 5.6 qui occupe une confortable deuxième place. Fruit 2.0 remporte le tournoi au départage devant List 5.12. Pharaon 3.2 est surclassé. 20.Cd6 Db8 21.Fb3 Txd6 22.Fxd6 Dxd6 23.c4 a5 24.cxd5 cxd5 25.Rb1 a4 26.Fc2 e4 27.Fxe4 a3 28.Fd3 Fxb2 0-1(31) Delphil 1.4 -- Madeleine 0.2; 0-1(31) Delphil 1.4 -- Arion 1.3; 27...Tb8 28.Td2 a3 0-1(33) Delphil 1.4 -- Queen 3.04; 25.The1 a4 26.Fc2 d4 27.Fe4 Tb8 28.a3 Dc5+ 1-0(92) Delphil 1.4 -- DelphiMAX 2.9; =-=(66) Delphil 1.4 -- Gaia 2.2a; 23...Dc7 24.cxd5 cxd5+ 25.Rb1 Ff5+ 26.Ra1 d4 27.Fd5 Tf8 28.Dd2 Dd7 1-0(74) Delphil 1.4 -- Adam 2.8a; 23...Rf8 24.Rb1 a5 25.Dd2 a4 26.Fc2 e4 27.cxd5 cxd5 28.fxe4 Tb8 0-1(48) Delphil 1.4 -- WJChess v1.64; 23...Ff5 24.Fc2 e4 25.cxd5 cxd5 26.fxe4 Db4 27.b3 Tc8 28.exf5 Da3+ 0-1(33) Delphil 1.4 -- Tornado 0.80.17beta; 21...a5 22.Ce4 a4 23.Fc4 Db7 24.c3 Cxc3 25.Txd8+ Txd8 26.Cd6 Cxa2+ 27.Fxa2 Txd6 28.Fxd6 Fxa2 =-=(91) Delphil 1.4 -- Chispa 4.0.3; 22...Db7 23.c3 a4 24.Fc4 Cxc3 25.Txd8+ Txd8 26.Cd6 Cxa2+ 27.Fxa2 Txd6 28.Fxd6 Fxa2 0-1(65) Delphil 1.4 -- Diablo 0.3; 20...Dc7 21.Fb3 Td7 22.Ce4 Tad8 23.Fa3 Db6 24.De1 Cf4 25.Txd7 Txd7 26.Cc5 Td8 27.Cxe6 fxe6 28.Rb1 a5 0-1(72) Delphil 1.4 -- Matheus 2.3. 20.Thg1 a5 21.b3 a4 22.Dd2 Dc7 23.Rb1 axb3 24.cxb3 Ff5 25.a4 Td7 26.Ra1 Cb6 27.Fxb6 Dxb6 28.Db2 Td4 0-1(49) Terra 3.4 -- Dragon 4.6. 20...a5 21.Dd3 Tdb8 22.Da3 Ce3 23.Fxe3 Fxc4 24.Cd6 Da6 25.Cxc4 Dxc4 26.Rb1 Tb7 27.Fc1 e4 28.fxe4 Dxe4 =-=(62) Gaia 2.2a -- Chispa 4.0.3. 20...Tdb8 21.Fb3 a5 22.Cd6 Dc7 23.a4 Cf4 24.Ce4 Fxb3 25.Fd6 Db6 26.Fxb8 Txb8 27.cxb3 Dxb3 28.Dc2 Dxf3 0-1(52) Gaia 2.2a -- Arion 1.3. 20...Td7 21.Da5 Tad8 22.Rb1 Dc7 23.Dxc7 Cxc7 24.Txd7 Txd7 25.Fe2 a5 26.Fb6 Cd5 27.Fxa5 Cf4 28.Fd1 Cg2 1-0(73) Gaia 2.2a -- Madeleine 0.2. 21...Td7 22.Ff2 Ff5 23.Th2 Tb8 24.Fc5 a5 25.Fb3 Tbd8 26.Thd2 a4 27.Fc4 Dc8 28.Td3 Db7 0-1(46) Gaia 2.2a -- Delphil 1.4; 23.Tg1 Tad8 24.Cc5 Td6 25.Th1 Cb6 26.Txd6 Txd6 27.Fd3 Fxd3 28.Cxd3 Td5 =-=(85) Gaia 2.2a -- Adam 2.8a. 21...Tab8 22.Rb1 a5 23.Fb3 Ff5 24.Tg1 Ff8 25.Fxf8 Rxf8 26.Cg3 Fe6 27.c4 Ce7 28.De3 a4 0-1(64) Gaia 2.2a -- Diablo 0.3. 21...Ff8 22.Fxf8 Rxf8 23.Cc5 Ff5 24.Rb1 Db6 25.Ca4 Db4 26.Dxb4+ Cxb4 27.Fb3 Tab8 28.Cc5 Txd1+ 0-1(68) Gaia 2.2a -- WJChess v1.64. 21...Ff5 22.Rb1 Tab8 23.Fb3 Ff8 24.Fxf8 Rxf8 25.De2 Cf4 26.Dc4 Fxe4 27.Dxe4 Td6 28.Txd6 Dxd6 =-=(71) Gaia 2.2a -- Matheus 2.3. 22...Db6 23.Fxe6 Cxe6 24.Rb1 Td7 25.Th2 Tb7 26.c3 Td8 27.Thd2 Db5 28.Fa3 Txd2 0-1(54) Gaia 2.2a -- DelphiMAX 2.9. 24...Ff8 25.Cc5 De8 26.Fxf8 Txd1+ 27.Dxd1 Dxf8 28.Cd7 De7 1-0(71) Gaia 2.2a -- Tornado 0.80.17beta. 28.Dc5 a3 0-1(56) Gaia 2.2a -- Queen 3.04. 20...Td7 21.Td2 Tad8 22.Thd1 a5 23.Fa3 Cf4 24.Fd6 Fxb3 25.axb3 Ce6 26.De3 Da6 27.Cf6+ Fxf6 28.gxf6 c5 0-1(49) Matheus 2.3 -- Queen 3.04. 20...Da6 21.Cd6 Ff8 22.Cc4 Cc3 23.bxc3 Fxc4 24.Fxf8 Txf8 25.Rb2 Tab8 26.The1 Tfe8 27.Dg3 Db5 28.Te4 Fd5 1-0(47) Matheus 2.3 -- WJChess v1.64. 21.a4 Cf4 22.Fxe6 Cxe6 23.Fd6 c5 24.Fxc5 Dc6 25.b3 Tac8 26.Txd8+ Txd8 27.Td1 Cd4 28.Td3 Td5 1-0(51) Frenzee 200 -- Abrok 5.0. 21...Dc7 22.c4 Txd6 23.Fxd6 Dxd6 24.Td2 a4 25.Fc2 Db4 26.cxd5 cxd5 27.a3 Dc4 28.Rd1 e4 0-1(40) Matheus 2.3 -- Arion 1.3; 27...Db7 28.Fd1 Ff5 0-1(35) Matheus 2.3 -- Gaia 2.2a; 25...e4 26.cxd5 cxd5 27.fxe4 De5 28.Tg1 Dxb2+ 0-1(46) Matheus 2.3 -- Tornado 0.80.17beta; 24...Db4 25.cxd5 cxd5 26.Rd1 Td8 27.Te1 Rh7 28.Dh2 e4 0-1(46) Matheus 2.3 -- Adam 2.8a. 22...Txd6 23.Fxd6 Dxd6 24.Td2 a4 25.Fc2 Db4 26.cxd5 cxd5 27.a3 Dc4 28.Rd1 Da2 0-1(74) Matheus 2.3 -- DelphiMAX 2.9. 23...Ff8 24.Dxe5 Fg7 25.De2 a4 26.Fxb4 Dxb4 27.De1 Db6 28.Dg1 c5 0-1(37) Matheus 2.3 -- Chispa 4.0.3. 24...Cb4 25.Fxb4 axb4 26.Ce4 Td4 27.Dg3 Fxc4 28.Txd4 Fxb3 0-1(60) Matheus 2.3 -- Diablo 0.3. 24...Ff8 25.Ce4 Txd1+ 26.Fxd1 Fxa3 27.bxa3 Dc7 28.Dc3 Td8 0-1(45) Matheus 2.3 -- Madeleine 0.2. 28.Db1 Da8 0-1(56) Matheus 2.3 -- Delphil 1.4. 20...a5 21.Thd1 a4 22.T3d2 Tdb8 23.Fa3 Ta5 24.Cd6 Dc7 25.Ce4 Db7 26.c3 Cxc3 27.Cd6 Cxd1 28.Cxb7 Cxf2 1-0(95) Ktulu 4.2 -- SlowChess Blitz WV; 21.Rb1 Tab8 22.Tb3 Dc7 23.Te1 a4 24.Txb8 Dxb8 25.Ff1 Cb4 26.a3 Cd5 27.Fa6 Dc7 28.c4 Ta8 0-1(46) Chispa 4.0.3 -- Arion 1.3. 23.Fd6 Db6 24.Dxb6 axb6 25.c3 Ta8 26.a3 Cf4 27.Rc2 Rh7 28.Th2 Ta4 =-=(80) SlowChess Blitz WV -- Ktulu 4.2; 28.Rb3 Ta5 1-0(56) SlowChess Blitz WV -- AnMon 5.50; 26...Ta5 27.Rc2 Td5 28.a4 Rh8 1-0(50) SlowChess Blitz WV -- Glaurung 0.2.1; 25...Cf4 26.Fc7 Td3 27.Fxb6 Cd5 28.Ff2 Txf3 =-=(54) SlowChess Blitz WV -- Spike 0.9a; 23...Cd4 24.Rb1 a5 25.Te1 Cf5 26.Fc5 Td5 27.Ra1 Dd7 28.a4 Cd4 1-0(63) SlowChess Blitz WV -- Tao 5.6. 23.Fe3 a5 24.c3 a4 25.De2 a3 26.b3 Cf4 27.Fxf4 exf4 28.Td1 Txd1+ =-=(49) Ktulu 4.2 -- AnMon 5.50; 26...Ff8 27.Td1 Txd1+ 28.Rxd1 Rg7 1-0(64) Ktulu 4.2 -- Glaurung 0.2.1; 25...Td5 26.Td1 Rh7 27.Td2 Da8 28.Dc4 Cc7 =-=(34) Ktulu 4.2 -- Tao 5.6; 24...Cf4 25.Fxf4 exf4 26.De2 Db6 27.Td1 Td5 28.Rc2 a4 =-=(42) Ktulu 4.2 -- Spike 0.9a. 24...Td4 25.Tc1 Td5 26.Da3 Rh7 27.c3 Rg8 28.c4 Td4 =-=(47) Zappa 1.0 -- Amyan 1.595; 25...Dd7 26.a3 Td1 27.Dc3 Txc1+ 28.Rxc1 Dd5 1-0(45) Zappa 1.0 -- Pepito v1.59; 25.b3 Dd7 26.Rb2 Td5 27.De3 De7 28.Ta1 Ta5 =-=(47) Fruit 2.0 -- Ruffian 1.0.5. 24...Db6 25.De7 Db8 26.Da3 Db6 27.Tc1 Ff8 28.Dc3 Td4 0-1(83) Zappa 1.0 -- Little Goliath Revival; 27.De7 Db8 28.Da3 Db6 1-0(65) Zappa 1.0 -- Naum 1.7. 26.Tc1 a5 27.Cc3 Td4 28.Ce4 Dc7 =-=(68) Zappa 1.0 -- Yace Paderborn. 26...Td4 27.Db3 Td5 28.Db8+ Rh7 0-1(55) Fruit 2.0 -- List 5.12. 26...Df5 27.De3 a5 28.b3 a4 1-0(50) Fruit 2.0 -- Aristarch 4.50. 26...Dc7 27.De3 Da5 28.a3 Td4 1-0(73) Fruit 2.0 -- SOS 5.1. 28.Rb1 Dh3 =-=(49) Fruit 2.0 -- Pharaon 3.2. 20...Cf4 21.Fxe6 Cxe6 22.The1 Cxc5 23.Dxc5 Td5 24.Txd5 cxd5 25.Cf6+ Fxf6 26.gxf6 Te8 27.Dd6 e4 28.Rb1 a5 =-=(65) Queen 3.04 -- Adam 2.8a; 25.Cd6 De7 26.Td1 Td8 27.Ce4 Dxc5 28.Cxc5 f6 =-=(59) Queen 3.04 -- WJChess v1.64. 20...a6 21.The1 Dc7 22.Fxd5 Txd5 23.c4 Txd1+ 24.Txd1 Td8 25.Txd8+ Dxd8 26.Fd6 Ff5 27.Dc5 De8 28.a4 Fxe4 =-=(42) Snitch 1.0.8 -- Hermann 1.3.5. 20...Td7 21.Td2 Tad8 22.Thd1 Dc7 23.De1 Cf4 24.Txd7 Txd7 25.Txd7 Dxd7 26.Fxe6 Cxe6 27.Da5 a6 28.Db6 Dc8 1-0(41) Queen 3.04 -- Tornado 0.80.17beta. 20...Dc7 21.a4 Td7 22.Td2 Tad8 23.Thd1 Ff5 24.De1 Rh8 25.Cg3 Fe6 26.Dg1 f5 27.gxf6 Fh6 28.Ce4 Fxd2+ 1-0(34) Queen 3.04 -- Matheus 2.3. 21.Rb1 a4 22.Df1 axb3 23.cxb3 Ff5 24.Td3 Cf4 25.Txd8+ Txd8 26.Dc1 Ce6 27.Fxe6 Fxe6 28.Td1 Fd5 =-=(80) Terra 3.4 -- Nejmet 3.07. 21...Dc7 22.Td2 Tab8 23.Thd1 Td7 24.Td3 Te8 25.Rb1 Ta8 26.Dg1 Tb8 27.Ff2 Tdd8 28.Cc5 Ff5 1-0(77) Hermann 1.3.5 -- Arion 1.3; 24...Rh8 25.Rb1 Tc8 26.De1 Tcd8 27.Dg1 Db7 28.Ff2 Rg8 0-1(76) Hermann 1.3.5 -- Booot 4.5; 23.Te1 Ff5 24.Ted1 Fe6 25.Dg1 Td7 26.Ff2 Tc8 27.Cc5 Te7 28.De1 Tee8 1-0(60) Queen 3.04 -- Arion 1.3; 22...Td7 23.Thd1 Tb8 24.Td3 Te8 25.Rb1 Dd8 26.Fa3 Ff5 27.Dd2 Dc7 28.Fxd5 cxd5 1-0(50) Hermann 1.3.5 -- Aice 0.92; 22.Fxd5 cxd5 23.Fb6 Dc6 24.Fxd8 dxe4 25.Rb1 exf3 26.Db6 Dxb6 27.Fxb6 e4 28.The1 Ff5 0-1(58) Snitch 1.0.8 -- Booot 4.5; 22...Txd5 23.Cc3 Td7 24.Ce4 Td5 25.De3 Ff5 26.Cf6+ Fxf6 27.gxf6 Rh7 28.Rb2 e4 1-0(53) Snitch 1.0.8 -- Aice 0.92. 21...Cf4 22.Cd6 Txd6 23.Fxd6 Fxc4 24.bxc4 e4 25.Fxf4 Db2+ 26.Rd2 Td8+ 27.Re1 Fc3+ 28.Fd2 Fxd2+ =-=(60) Queen 3.04 -- DelphiMAX 2.9; 22...De7 23.Cc8 Txd1+ 24.Txd1 De8 25.Cd6 Dd7 26.Cf5 Fd5 27.Cxg7 Rxg7 28.Ff1 Df5 1-0(65) Snitch 1.0.8 -- Patzer 3.61; 22.Fxe6 Cxe6 23.Fd6 c5 24.Fxc5 Cd4 25.Td3 Td5 26.Thd1 Tc8 27.Tc3 Tcd8 28.Td2 T5d7 0-1(74) Hermann 1.3.5 -- Patzer 3.61. 21...Rh7 22.De1 Dc7 23.Rb1 Cf4 24.Fd6 Dc8 25.Fxe6 Dxe6 26.Df2 Cd5 27.Dc5 Df5 28.Dxc6 Ce3 1-0(73) Hermann 1.3.5 -- Muse 0.899b; 22.Fd6 Te8 23.Dh2 Ce3 24.Cc5 Da7 25.Fxe6 Cxd1 26.Fd7 Ce3 27.Fxe8 Txe8 28.Ce4 Cf5 0-1(73) Snitch 1.0.8 -- Muse 0.899b. 21...Db8 22.Rb1 Db7 23.Td3 Ff5 24.Dd2 Tac8 25.Td1 Dc7 26.Ff2 Fe6 27.Fe1 Ta8 28.Fg3 Tac8 =-=(42) Hermann 1.3.5 -- Snitch 1.0.8. 22.Thf1 Dc7 23.Tfe1 Ff5 24.Fa3 Tad8 25.Fb2 Cb4 26.Txd7 Dxd7 27.Rb1 Cd5 28.Dc5 Dc7 0-1(83) Snitch 1.0.8 -- Arion 1.3. 22.Rb1 Tad8 23.Td3 Ff5 24.Tf1 Db8 25.Tc1 Db7 26.Th1 Fe6 27.Te1 Ff5 28.De2 Db8 =-=(127) Hermann 1.3.5 -- Sjeng 12.13. 22.Fd6 Tad8 23.Dc5 Da8 24.c3 Txd6 25.Cxd6 Ff8 26.Df2 Txd6 27.Rb2 Db8 28.De2 Ce3 0-1(46) Snitch 1.0.8 -- Sjeng 12.13. 22...Ff5 23.Cd6 Dc7 24.Cxf5 gxf5 25.Thd1 Db7 26.Dg3 e4 27.g6 Tdd8 28.fxe4 fxe4 1-0(32) Queen 3.04 -- Madeleine 0.2. 23...Db8 24.Fa3 Ff5 25.Fb2 Cb6 26.Txd7 Txd7 27.Fd3 Cd5 28.Cc5 Td8 1-0(42) Queen 3.04 -- Chispa 4.0.3. 25...Rh7 26.Dg1 Rg8 27.De1 Te8 28.Cg3 Fe6 1-0(73) Queen 3.04 -- Diablo 0.3. 26.Cg3 Fe6 27.Te1 Db8 28.Ce4 Ff5 1-0(60) Queen 3.04 -- Gaia 2.2a. 28.Dg1 Db8 1-0(77) Queen 3.04 -- Delphil 1.4. 20...Tab8 21.Fb3 a5 22.Fa3 a4 23.Fxa4 Cb4 24.b3 Td4 25.Cc5 De7 26.Txd4 exd4 27.Cxe6 Dxe6 28.Fxb4 Txb4 0-1(50) Naum 1.7 -- Zappa 1.0; 23.Fc4 Ff5 24.Te1 Ff8 25.Cc5 Da8 26.Txe5 Fd6 27.Te4 Ff4 28.Txf4 Cxf4 0-1(77) Pepito v1.59 -- Zappa 1.0; 22...Cf4 23.Fd6 Ta8 24.Fxe6 Cxe6 25.Te1 Td7 26.Dg3 Tad8 27.Fxe5 Fxe5 28.Dxe5 Txd2 0-1(59) Pepito v1.59 -- Little Goliath Revival; 21.b3 Td7 22.Fd6 Txd6 23.Cxd6 Db4 24.Ce4 Cc3 25.Dxa7 Cxe4 26.fxe4 Fxc4 27.a3 Db5 28.Thd1 Rh7 0-1(35) Naum 1.7 -- Little Goliath Revival. 20...Dc7 21.Thd1 Ce3 22.Dxe3 Fxc4 23.Txd8+ Txd8 24.Txd8+ Dxd8 25.b3 Fd5 26.Fxa7 Dd7 27.Cc3 Fxf3 28.Dxf3 Dxa7 1-0(51) Diablo 0.3 -- Tornado 0.80.17beta. 20...Cc7 21.Fxe6 Cxe6 22.Thd1 Txd2 23.Txd2 Cxc5 24.Cxc5 Db6 25.Ce4 Tf8 26.Dxb6 axb6 27.Td6 Tc8 28.a3 Ff8 1-0(65) Diablo 0.3 -- Adam 2.8a. 20...Rh8 21.Thd1 Dc7 22.a3 a6 23.Dg1 a5 24.Fa2 Tg8 25.Fd6 Da7 26.Dg3 Ce3 27.Fc5 Db8 28.Fxe3 Fxa2 0-1(59) Aice 0.92 -- Booot 4.5. 21.Fa3 Dc7 22.Cc5 Dc8 23.Thd1 a4 24.De1 Ta7 25.Cxe6 Dxe6 26.De4 Tad7 27.Fb4 Dh3 28.Fa5 Tb8 1-0(63) Diablo 0.3 -- Arion 1.3; 22...Db6 23.Cxe6 Dxf2 24.Txf2 fxe6 25.Td2 Td7 26.Fc5 Ff8 27.Ff2 a4 28.Fg3 Tf7 1-0(76) Diablo 0.3 -- Matheus 2.3; 22...Ff5 23.Thd1 Cf4 24.Ce4 Cd5 25.Fxd5 cxd5 26.Txd5 Txd5 27.Txd5 Dc4 28.Cc3 Df4+ 0-1(44) Diablo 0.3 -- Chispa 4.0.3; 21...Dc8 22.Thd1 a4 23.Dg3 Rh7 24.Cf6+ Fxf6 25.gxf6 Dc7 26.Te1 Cf4 27.Txd8 Txd8 28.Fxe6 Da5 1-0(74) Diablo 0.3 -- Gaia 2.2a; 21...Rh8 22.Cc5 De7 23.Te1 Ff5 24.Ted1 Dc7 25.Fxd5 Txd5 26.Txd5 cxd5 27.Txd5 Dc6 28.Dd2 Db5 0-1(45) Diablo 0.3 -- Madeleine 0.2. 21.Te1 Rh7 22.Fa3 Dc7 23.Dg3 Rg8 24.Dg1 Rh8 25.Ted1 Rg8 26.Fc5 Rh8 27.Ff1 Cb4 28.a3 Txd2 1-0(67) Naum 1.7 -- Pepito v1.59. 21...Tab8 22.Fa3 Ff8 23.Cc5 Dc7 24.Fb3 Fxc5 25.Dxc5 Tb5 26.Dg1 Tbb8 27.Df2 Ff5 28.Fxd5 cxd5 =-=(74) Ufim 6.00 -- Abrok 5.0; 23...Da8 24.Dg1 Ff5 25.De1 Rh7 26.Dg1 a4 27.Te2 Fd6 28.Ted2 Fe7 1-0(61) Tao 5.6 -- SlowChess Blitz WV; 22...Dc7 23.Cc5 Ff8 24.Fb3 Db6 25.Cxe6 Dxf2 26.Txf2 fxe6 27.Fxf8 Txf8 28.Te2 Tf5 =-=(52) Aice 0.92 -- Sjeng 12.13. 22...Td8 23.Cc5 De7 24.Cxe6 Dxe6 25.Td3 Df5 26.Fxd5 cxd5 27.Txd5 Df4+ 28.T5d2 Txd2 =-=(77) Aice 0.92 -- Arion 1.3. 24.Fb3 a4 25.Cxa4 Dxf2 26.Txf2 Fxa3 27.bxa3 Ta5 28.Te1 Cf4 1-0(55) Tao 5.6 -- AnMon 5.50. 24...Te8 25.Fb3 Db8 26.c3 a4 27.Fc4 Ta5 28.Dg1 Da7 =-=(67) Aristarch 4.50 -- Fruit 2.0. 28.bxa3 Tb5 0-1(87) Aice 0.92 -- Snitch 1.0.8. 21...Cxe6 22.Thd1 Txd2 23.Txd2 Cxc5 24.Cxc5 Db6 25.c3 Da5 26.a3 Td8 27.Txd8+ Dxd8 28.Ce4 Da5 1-0(68) List 5.12 -- Ruffian 1.0.5; 25.Td7 Td8 26.Tb7 Da5 27.a3 Ff8 28.Ce4 a6 1-0(37) Aice 0.92 -- Hermann 1.3.5; 25.Ce4 Da6 26.Rb1 Dc8 27.a3 Dh3 28.Td6 Tc8 1-0(55) Aristarch 4.50 -- Ruffian 1.0.5. 22.Cxd2 Cxe6 23.Rb1 Cxc5 24.Dxc5 Td8 25.Ce4 Td4 26.a3 Td5 27.Db4 Dc7 28.Te1 a5 1-0(68) Ufim 6.00 -- Terra 3.4; 24...Db6 25.Ce4 Dxc5 26.Cxc5 Td8 27.Ce4 Rf8 28.b4 Re7 0-1(49) Ufim 6.00 -- Frenzee 200; 23...Tb8 24.b3 Cxc5 25.Dxc5 Td8 26.Cc4 Td5 27.De3 a5 28.Db6 Dd7 0-1(48) Ufim 6.00 -- Nejmet 3.07. 23.Td1 Td8 24.Fd6 Cd4 25.Rb1 Dc8 26.Df2 Dh3 27.Fb4 Tb8 28.Fd6 Ta8 =-=(63) Aristarch 4.50 -- Pharaon 3.2; 26...Cf5 27.Td3 De6 28.Dd2 Cxh4 =-=(98) Aristarch 4.50 -- List 5.12; 25.Df2 Cf5 26.Td2 Cxd6 27.Cxd6 Db6 28.De1 Da6 1-0(44) Aristarch 4.50 -- SOS 5.1; 24.De2 Txd1+ 25.Dxd1 Cxc5 26.Cxc5 De7 27.Dg1 f6 28.gxf6 Dxf6 =-=(46) Diablo 0.3 -- WJChess v1.64; 24...Td5 25.Fe3 Cd4 26.Fxd4 exd4 27.Cf6+ Fxf6 28.De8+ Rg7 =-=(75) Diablo 0.3 -- Queen 3.04; 23...Tb8 24.Dc3 Da6 25.a3 Cd4 26.Rb1 Cf5 27.Td7 Cxh4 28.Fxa7 Tb7 1-0(67) Diablo 0.3 -- DelphiMAX 2.9; 23...Cxc5 24.Cxc5 Db5 25.Ce4 a5 26.Dd3 Db6 27.a3 Tb8 28.Dc3 a4 1-0(68) Diablo 0.3 -- Delphil 1.4. 23.Dc3 Td8 24.Rb1 Td5 25.Te1 Cxc5 26.Cxc5 Db5 27.Ce4 a5 28.Tc1 Db6 0-1(75) Ufim 6.00 -- Dragon 4.6. 23...Cd4 24.c3 Cf5 25.Fc5 Dc7 26.Df2 Td8 27.Fxa7 Da5 28.a3 Td5 1-0(65) List 5.12 -- Aristarch 4.50; 25...Db5 26.Df2 a6 27.Td1 Da5 28.Rb1 Td8 1-0(86) Naum 1.7 -- Amyan 1.595; 24.f4 Da6 25.Rb1 exf4 26.Fxf4 Da4 27.c3 Cf5 28.De2 Td8 =-=(139) Pepito v1.59 -- Amyan 1.595. 23...Db5 24.c3 Td8 25.Td1 a5 26.Dd3 Cf4 27.Dc2 Db6 28.Te1 Da6 1-0(93) Pepito v1.59 -- Yace Paderborn; 24.Td1 Td8 25.Df2 Cd4 26.Td3 Da6 27.a3 Cf5 28.Td2 Cxd6 =-=(58) Naum 1.7 -- Yace Paderborn. 23...Da6 24.Rb1 Td8 25.c3 c5 26.Td1 c4 27.Dc2 Cf4 28.Fe7 Tb8 =-=(108) Aice 0.92 -- Patzer 3.61. 24.a3 Cd4 25.Dg2 a5 26.a4 Dd7 27.Fc5 Df5 28.Fxd4 exd4 0-1(64) Aice 0.92 -- Muse 0.899b. 24.Df2 Db6 25.Tf1 Td7 26.a3 Dd4 27.Dxd4 Cxd4 28.Fc5 Cf5 =-=(57) Pepito v1.59 -- Naum 1.7. 24.Rb1 Cd4 25.Df2 Dd7 26.a3 Df5 27.Tf1 Dh3 28.Fe7 Td7 1-0(49) List 5.12 -- Pharaon 3.2. 24...a6 25.Td1 Db5 26.Dxb5 axb5 27.c3 Cf4 28.Td2 Ta8 1-0(79) Tao 5.6 -- Glaurung 0.2.1. 26...Cf4 27.Fc7 Td3 28.Fxb6 Cd5 =-=(59) Tao 5.6 -- Spike 0.9a. 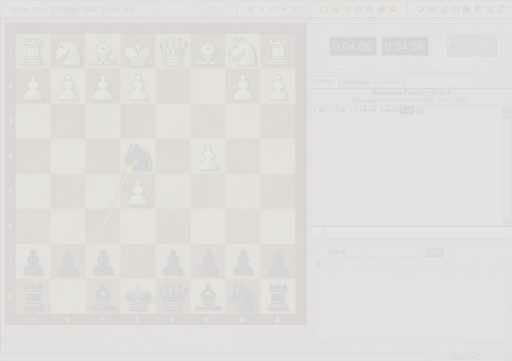 28.a4 Cf4 1-0(59) Tao 5.6 -- Ktulu 4.2. 20...Td7 21.Td3 Tad8 22.Thd1 Cf4 23.Txd7 Txd7 24.Txd7 Dxd7 25.Dd2 Dxd2 26.Cxd2 Fxc4 27.Cxc4 a6 28.Ca5 Ce6 =-=(57) Nejmet 3.07 -- Terra 3.4; 22.Dd2 Cf4 23.Txd7 Txd7 24.Dc3 Fxc4 25.Dxc4 Db5 26.Dxb5 cxb5 27.c3 a6 28.Rc2 Td3 1-0(107) Abrok 5.0 -- Terra 3.4. 20...Tab8 21.Fb3 a5 22.Cd6 Da8 23.a4 Td7 24.The1 Tbd8 25.Ce4 Db8 26.Td3 Cf4 27.Txd7 Txd7 28.Fxe6 Cxe6 =-=(118) Arion 1.3 -- Madeleine 0.2. 21.Fa3 Cc3+ 22.Cxc3 Fxc4 23.f4 Tdb8 24.fxe5 Fxe5 25.Df3 Fd5 26.Cxd5 Fxb2 27.Ce7+ Rg7 28.Td7 Dxd7 1-0(81) Arion 1.3 -- DelphiMAX 2.9; 24...Ff8 25.Td6 Fxd6 26.exd6 Te8 27.Df4 Fd5 28.Td1 Te6 1-0(57) Arion 1.3 -- Chispa 4.0.3; 21...a4 22.Dd2 Dc7 23.Cc5 Ff5 24.De1 Ff8 25.Fd3 Db6 26.Fxf5 Fxc5 27.Fxc5 Dxc5 28.Fe4 a3 1-0(47) Arion 1.3 -- Snitch 1.0.8; 21...Tdb8 22.The1 Ff8 23.Fxd5 Fxa3 24.Cf6+ Rh8 25.Fb3 a4 26.bxa3 axb3 27.axb3 Fxb3 28.Rc1 Fa4 0-1(33) Arion 1.3 -- Muse 0.899b; 21...Tab8 22.Fb3 a4 23.Fxa4 Ff8 24.Fb3 Fxa3 25.bxa3 De7 26.a4 Ff5 27.Ra1 Fxe4 28.fxe4 Cf4 =-=(63) Arion 1.3 -- Queen 3.04; 21...Dc7 22.The1 Ff5 23.Fc5 Tab8 24.Td3 Fxe4 25.fxe4 Cf4 26.Txd8+ Dxd8 27.Tf1 a4 28.c3 Da5 1-0(57) Arion 1.3 -- Matheus 2.3; 21...Da7 22.De1 a4 23.Fc5 Db8 24.Td3 Cf4 25.Txd8+ Dxd8 26.Fxe6 Cxe6 27.Fd6 Dd7 28.Dg3 Ta5 0-1(45) Arion 1.3 -- Sjeng 12.13. 21.Td3 a4 22.Ta3 Tdb8 23.c3 Ff5 24.Ra1 Dd7 25.Td1 Fxe4 26.fxe4 Dg4 27.Te1 Cf4 28.Tg1 Td8 0-1(57) Sjeng 12.13 -- Snitch 1.0.8; 21...Tab8 22.c3 Da8 23.Dc2 Ce3 24.Txe3 Fxc4 25.Cd6 Da6 26.Da4 Fd5 27.Tc1 Txd6 28.Fxd6 Txb2+ =-=(167) Sjeng 12.13 -- Arion 1.3; 21...Cf4 22.Txd8+ Txd8 23.Fxe6 Cxe6 24.Fd6 a4 25.De3 Cd4 26.Td1 Cf5 27.De1 Db6 28.Fc5 Txd1+ 1-0(50) Sjeng 12.13 -- Muse 0.899b. 21.Ra1 a4 22.Fa3 Cf4 23.Fxe6 Cxe6 24.Fd6 Td7 25.Td2 Tad8 26.Tc1 c5 27.c3 Dc6 28.Tcd1 c4 1-0(82) Abrok 5.0 -- Ufim 6.00; 21...Tab8 22.c3 a4 23.Td2 Dc7 24.Te1 Ta8 25.Ff1 Da5 26.Ted1 a3 27.Fxa3 Tdb8 28.c4 Cb6 1-0(91) Abrok 5.0 -- Nejmet 3.07. 21.Td2 Tdb8 22.b3 a4 23.Thd1 Rh8 24.Dh2 Td8 25.Td3 axb3 26.cxb3 Ta5 27.Db2 Rg8 28.a3 Tda8 0-1(47) Terra 3.4 -- Ufim 6.00. 21...Tdb8 22.c3 Td8 23.The1 Dc7 24.Dc1 Tab8 25.a4 Ff5 26.Dc2 Ff8 27.Fxf8 Rxf8 28.Td3 Rg8 =-=(91) Madeleine 0.2 -- Chispa 4.0.3; 23...Ff5 24.Ra1 Dc7 25.Df2 Td7 26.Te2 Tb8 27.Ted2 Fe6 28.Fa3 Tdd8 1-0(47) Madeleine 0.2 -- DelphiMAX 2.9. 22.Dc1 Cc3+ 23.Cxc3 Fxc4 24.Txd8+ Txd8 25.Td1 Fd5 26.De3 Rh7 27.Td3 Te8 28.Fa3 Da8 1-0(65) Nejmet 3.07 -- Ufim 6.00. 23.Dc1 Fxc5 24.Cxc5 Ff5+ 25.Ce4 Da7 26.Td3 Cf4 27.Txd8+ Txd8 28.De1 Dc5 0-1(84) DelphiMAX 2.9 -- Arion 1.3. 23.Fxf8 Ce3 24.Fxe6 Txd2 25.Txd2 fxe6 26.Fd6 Td8 27.Te2 Cf5 28.Cf6+ Rf7 0-1(38) DelphiMAX 2.9 -- Matheus 2.3. 24...Ff5 25.Fxf8 Ce3 26.Dh2 Cxd1 27.Txd1 Txd1+ 28.Fxd1 Rxf8 0-1(69) Madeleine 0.2 -- Matheus 2.3. 26...Da6 27.Fb3 Txb3 28.axb3 Fxb3 0-1(33) Madeleine 0.2 -- Arion 1.3. 28.axb3 Dxb3 0-1(36) Madeleine 0.2 -- Queen 3.04. 21...Txd1+ 22.Txd1 Fxc4 23.f4 a5 24.fxe5 Fxe5 25.Fd4 De7 26.De3 Fd6 27.Ce4 De6 28.b3 Fd5 1-0(38) Sjeng 12.13 -- Aice 0.92; 26.Fxe5 Dxe5 27.Te1 Db8 28.Dc5 Dg3 0-1(59) Arion 1.3 -- Aice 0.92. 22.Txd8+ Txd8 23.Td1 Txd1+ 24.Cxd1 Dd7 25.Ce3 Ff8 26.Fxf8 Rxf8 27.b3 Fe6 28.c3 a5 =-=(52) Nejmet 3.07 -- Frenzee 200; 25.Cc3 Dh3 26.Fe3 Dh1+ 27.Fc1 Fe6 28.Dxa7 Dxf3 =-=(41) Nejmet 3.07 -- Abrok 5.0; 24...a5 25.Cc3 Dc8 26.b3 Fd5 27.Dg2 a4 28.Cxd5 cxd5 =-=(94) Nejmet 3.07 -- Dragon 4.6; 23.b3 a6 24.Ce4 Fe6 25.De3 Dd7 26.Cf6+ Fxf6 27.gxf6 Dd2 28.Dxe5 Td5 0-1(102) Sjeng 12.13 -- Hermann 1.3.5; 23...Fe6 24.Fxa7 Ff5 25.Fc5 Da8 26.Fb6 Td7 27.a4 Df8 28.Ce4 Fxe4 1-0(57) Sjeng 12.13 -- Booot 4.5. 22.De3 Tdb8 23.b3 a5 24.Fd6 Te8 25.Ce4 a4 26.Cf6+ Fxf6 27.gxf6 Rh7 28.Td2 Fd5 0-1(65) Abrok 5.0 -- Frenzee 200; 22...Fe6 23.Fd6 Db6 24.The1 Te8 25.Ce4 Dxe3 26.Txe3 Tad8 27.Ta3 Td7 28.Cc5 Tdd8 1-0(84) Abrok 5.0 -- Dragon 4.6; 22...Fd5 23.b3 a5 24.Th2 Fe6 25.Txd8+ Txd8 26.Fb6 Ta8 27.Td2 Rh7 28.Td3 Ff5 0-1(72) Terra 3.4 -- Frenzee 200. 22...Fd5 23.The1 Dc7 24.f4 exf4 25.Te7 Db8 26.Cxd5 Txd5 27.Txd5 cxd5 28.Te2 a5 =-=(49) Terra 3.4 -- Abrok 5.0; 23.Td3 Td7 24.De3 Fe6 25.Txd7 Dxd7 26.Td1 Fd5 27.Dd3 Td8 28.Da6 Dh3 0-1(43) Madeleine 0.2 -- Delphil 1.4; 23.Ce4 a5 24.c4 Fe6 25.Cd6 Db8 26.De3 a4 27.b4 Ff8 28.Ce4 a3 1-0(48) Sjeng 12.13 -- Patzer 3.61. 22...a5 23.Txd8+ Txd8 24.Fb6 Tb8 25.Fxa5 Fe6 26.Te1 c5 27.Ce4 c4 28.b4 Db5 1-0(65) Madeleine 0.2 -- Tornado 0.80.17beta. 22...Txd1+ 23.Txd1 Fe6 24.Dg3 Fd5 25.Fd6 Te8 26.Te1 Dd7 27.Fxe5 Fxe5 28.Txe5 Txe5 1-0(48) Madeleine 0.2 -- WJChess v1.64. 28.Te1 f3 0-1(81) Madeleine 0.2 -- Adam 2.8a; 0-1(38) Madeleine 0.2 -- Diablo 0.3; 1-0(51) Madeleine 0.2 -- Gaia 2.2a. 22...Txd1+ 23.Txd1 Fd5 24.Cd6 Dd7 25.Df1 Td8 26.c4 Fe6 27.Td2 Dc7 28.De1 Ff8 0-1(68) Arion 1.3 -- Diablo 0.3; 24...Da6 25.b3 Fe6 26.Ce4 Da5 27.Fe7 Fd5 28.c4 Fe6 1-0(75) Arion 1.3 -- WJChess v1.64; 23...Tb8 24.b3 a6 25.Cd6 Dd7 26.Rc1 Fd5 27.c4 Fe6 28.Cf5 Dxd1+ 1-0(63) Arion 1.3 -- Tornado 0.80.17beta. 22...Td5 23.Cd6 Dd7 24.b3 Tb8 25.Rc1 Fa6 26.c4 Txd1+ 27.Txd1 Ta8 28.Ce4 Df5 1-0(55) Arion 1.3 -- Booot 4.5. 22...Fd5 23.The1 Fxe4 24.fxe4 Td7 25.Txd7 Dxd7 26.Df3 Td8 27.Tf1 Ff8 28.Fxf8 Rxf8 0-1(62) Arion 1.3 -- Patzer 3.61. 23...Txd1+ 24.Txd1 Dc7 25.De1 Fd5 26.Td3 a6 27.Df2 Dd7 28.Cc3 Tb8 0-1(71) Arion 1.3 -- Delphil 1.4. 23...Dc7 24.Txd8+ Dxd8 25.Da3 Dd5 26.Da5 a6 27.Te1 Rh7 28.Da3 a5 =-=(61) Arion 1.3 -- Hermann 1.3.5. 24...Tdd8 25.Fd6 Db6 26.De4 Te8 27.Ca4 Da5 28.Db4 Dxb4 1-0(100) Arion 1.3 -- Gaia 2.2a. 28.Fd6 Te8 0-1(96) Arion 1.3 -- Adam 2.8a. 20...Rh8 21.a3 a5 22.b3 a4 23.Td2 axb3 24.cxb3 Cf4 25.Cd6 Txd6 26.Txd6 Fxc4 27.bxc4 Ff8 28.Dc2 Te8 0-1(42) SOS 5.1 -- Aristarch 4.50; 21...Dc7 22.Td3 a5 23.b3 a4 24.Ted1 axb3 25.cxb3 Td7 26.Rb2 Da5 27.Dd2 Dd8 28.a4 Tb7 0-1(69) SOS 5.1 -- Ruffian 1.0.5; 21.Td2 a5 22.Fa3 Dc7 23.Cc5 Ff5 24.Ted1 Rg8 25.Fxd5 cxd5 26.Txd5 Txd5 27.Txd5 Tc8 28.De2 Dc6 =-=(37) Amyan 1.595 -- Pepito v1.59; 21...Cf4 22.Fxe6 Txd2 23.Cxd2 Cxe6 24.Fd6 e4 25.c3 exf3 26.Dxf3 Td8 27.Cc4 Rg8 28.Fe5 Cc5 =-=(33) Ruffian 1.0.5 -- Aristarch 4.50; 21.Dd2 a5 22.Rb1 Td7 23.Tg1 a4 24.Ra1 Cf4 25.Dc3 Cd5 26.Da3 Tad8 27.Tc1 Da8 28.Cf6 Tb7 0-1(83) Pharaon 3.2 -- Aristarch 4.50; 21...Dc7 22.Rb1 Td7 23.Fb3 a5 24.De2 a4 25.Fc4 Tad8 26.Df1 Db8 27.Fa6 a3 28.b3 Ff5 =-=(36) Pharaon 3.2 -- Ruffian 1.0.5; 21.b3 a5 22.Fxd5 cxd5 23.Cf6 a4 24.Txe5 axb3 25.axb3 Tdc8 26.Dd4 Ta2 27.Td3 Db5 28.b4 Da4 1-0(56) Yace Paderborn -- Pepito v1.59; 21.Td3 a5 22.Tb3 Dc7 23.a4 Tab8 24.Txb8 Dxb8 25.Td1 Rg8 26.Td3 Dc7 27.Rb1 Cf4 28.Fb6 Cxd3 1-0(51) Little Goliath Revival -- Pepito v1.59; 21.Rb1 a5 22.Dh2 Tab8 23.Fa3 Cc3+ 24.Cxc3 Fxc4 25.b3 a4 26.Cxa4 Txd1+ 27.Txd1 Fd5 28.Fd6 Te8 1-0(43) Muse 0.899b -- Booot 4.5. 21.a4 Td7 22.Fa3 Ff5 23.b3 Tad8 24.Cc5 Db6 25.Td2 Td6 26.Fb2 Te8 27.Rb1 Ted8 28.a5 Db4 0-1(56) Adam 2.8a -- Delphil 1.4; 21...Ff5 22.b3 Td7 23.c3 Tad8 24.Rb2 Cb6 25.Fe2 Cd5 26.Td2 Cf4 27.Txd7 Dxd7 28.Fc4 Fxe4 1-0(46) Adam 2.8a -- Matheus 2.3. 21.Ff1 f5 22.gxf6 Cxf6 23.Txd8+ Dxd8 24.Cg5 Fxa2 25.b3 Da5 26.Fc4+ Cd5 27.Ce4 Rh8 28.Rb2 Cb6 1-0(48) Chispa 4.0.3 -- Matheus 2.3; 21...Cf4 22.Rb1 Txd1+ 23.Txd1 Da5 24.a3 Ff8 25.Fxf8 Rxf8 26.Td6 Td8 27.b4 Tb8 28.Rb2 Db6 1-0(47) Chispa 4.0.3 -- Delphil 1.4. 21.Rb1 Cc3+ 22.Cxc3 Fxc4 23.Txd8+ Dxd8 24.Td1 Da5 25.De3 Fe6 26.Td6 Ff8 27.Txc6 Fd7 28.Td6 Fxd6 0-1(40) DelphiMAX 2.9 -- Delphil 1.4. 21...Td7 22.Ted1 a5 23.Fa3 Tdd8 24.Cc5 Ff8 25.Cxe6 fxe6 26.Fxf8 Txf8 27.Fd3 Rg7 28.c4 Cb6 1-0(65) WJChess v1.64 -- Matheus 2.3; 22.Fa3 Tdd8 23.Cc5 Ff5 24.Ted1 Cf4 25.Ca6 Txd2 26.Txd2 Da5 27.Fb4 Db6 28.Fc5 Db7 1-0(48) Tornado 0.80.17beta -- Matheus 2.3. 23.De1 Te8 24.Dg3 Ted8 25.Cf6+ Fxf6 26.gxf6 Rh7 27.Dg5 Cf4 28.Txd8 Txd8 =-=(102) Tornado 0.80.17beta -- Delphil 1.4. 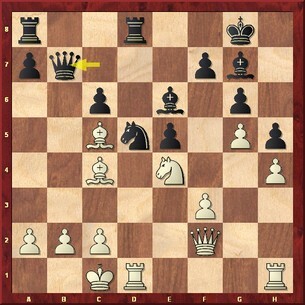 28.Dg3 Tbd8 0-1(47) WJChess v1.64 -- Delphil 1.4. 21.a4 Tad8 22.b3 Dc7 23.c3 Ff5 24.Rb2 Da5 25.b4 Dc7 26.a5 Db8 27.Fe2 Db7 28.a6 Db8 =-=(51) Adam 2.8a -- WJChess v1.64; 22...Cf4 23.Txd7 Txd7 24.Fxe6 Cxe6 25.Rb1 Db8 26.Fe3 Cd4 27.Ra2 Cf5 28.Fc5 Dc7 1-0(44) Adam 2.8a -- Queen 3.04. 21.Rb1 Cc3+ 22.Cxc3 Txd1+ 23.Txd1 Fxc4 24.De3 Da6 25.Td6 Fe6 26.De4 Tc8 27.b3 Df1+ 28.Rb2 Ff5 0-1(49) DelphiMAX 2.9 -- WJChess v1.64. 21.Ff1 Tb8 22.c4 Cf4 23.Txd7 Dxd7 24.Td1 Db7 25.Cf6+ Fxf6 26.gxf6 Da6 27.b3 Da5 28.Rb2 Ff5 1-0(40) Chispa 4.0.3 -- WJChess v1.64. 21.Fb3 Tad8 22.Fa3 Cf4 23.Txd7 Dxd7 24.Cc5 Dd4 25.Dxd4 Txd4 26.Cxe6 Cxe6 27.Fxe6 fxe6 28.Te4 a6 1-0(38) Frenzee 200 -- Terra 3.4. 21.Fa3 Db6 22.Td2 Dxf2 23.Txf2 Cc7 24.Cc5 Td4 25.Cxe6 Cxe6 26.Fxe6 fxe6 27.Th2 Tad8 28.b3 Tf4 =-=(82) Dragon 4.6 -- Terra 3.4. 21...Cf4 22.Fd6 Fxc4 23.Cc5 Dc8 24.Cxd7 Dxd7 25.Fxe5 Ch3 26.Txd7 Cxf2 27.Fxg7 Rxg7 28.b3 Fd5 =-=(47) Tornado 0.80.17beta -- WJChess v1.64. 22.Fb3 Cf4 23.Fxe6 Txd2 24.Cxd2 Cxe6 25.Fe3 Tb8 26.Cb3 a5 27.Fa7 Ta8 28.Fe3 Db5 0-1(57) Tornado 0.80.17beta -- Queen 3.04. 28.Fxa7 Db1+ 0-1(47) Patzer 3.61 -- Booot 4.5. 21.Ff1 Td5 22.c4 Tdd8 23.Fd6 Da6 24.a3 Ff5 25.Cc5 Db6 26.Fxe5 Ce6 27.Txd8+ Txd8 28.b4 Cxc5 =-=(126) Chispa 4.0.3 -- Queen 3.04; 22.Txd5 cxd5 23.Cf6+ Fxf6 24.gxf6 Dc7 25.Fe3 Ff5 26.Fxf4 exf4 27.c3 Db6 28.Dxb6 axb6 =-=(38) List 5.12 -- SOS 5.1; 21...Txd1+ 22.Txd1 Fxa2 23.b3 Fxb3 24.cxb3 Dxb3 25.Db2 Dxb2+ 26.Rxb2 Ce6 27.Tc1 Tb8+ 28.Ra2 Tb7 =-=(72) Chispa 4.0.3 -- DelphiMAX 2.9; 21...Tab8 22.Txd8+ Txd8 23.Cf6+ Fxf6 24.gxf6 Fxa2 25.De3 Fd5 26.Dxe5 Ce6 27.Fe7 Td7 28.De3 c5 0-1(78) Yace Paderborn -- Naum 1.7; 21...Fxa2 22.Txd8+ Txd8 23.Cf6+ Fxf6 24.gxf6 Ce6 25.Fe7 Td4 26.Txe5 Db6 27.De1 Fd5 28.b3 Tf4 1-0(59) Yace Paderborn -- Amyan 1.595. 21...Txd1+ 22.Txd1 Cxe6 23.Td3 Cf4 24.Td2 a5 25.Td1 Tb8 26.Fa3 Ce6 27.Td3 a4 28.De1 Cd4 0-1(50) Tornado 0.80.17beta -- DelphiMAX 2.9; 23.De3 Cxc5 24.Cxc5 Db4 25.Ce4 Tb8 26.b3 Db6 27.Dxb6 axb6 28.Td7 Ta8 1-0(51) Little Goliath Revival -- Naum 1.7; 23.Rb1 a5 24.Fa3 Tb8 25.c4 Da6 26.Df1 Tb7 27.Dd3 Db6 28.Dc3 a4 =-=(94) Adam 2.8a -- DelphiMAX 2.9; 23.Fe3 a5 24.Cc5 Cxc5 25.Fxc5 Tb8 26.c3 Db5 27.Rb1 Dc4 28.Fe3 a4 0-1(55) Amyan 1.595 -- Naum 1.7; 23.Fd6 Td8 24.Td3 Cf4 25.Ta3 Db5 26.Cc3 Ch3 27.De1 Db7 28.Fc5 Ta8 1-0(106) WJChess v1.64 -- DelphiMAX 2.9. 22.Td6 Cxc5 23.Dxc5 Txd6 24.Dxd6 Db6 25.c3 a5 26.Dc5 Dxc5 27.Cxc5 f6 28.Cd7 fxg5 0-1(51) Glaurung 0.2.1 -- Spike 0.9a. 23.Df1 Td7 24.c3 Tad8 25.Td2 a5 26.Ted1 De3 27.Rb1 Df4 28.Dc4 Dxf3 0-1(60) Booot 4.5 -- Muse 0.899b; 24.Td2 Tad8 25.Rb1 Db5 26.Df2 Cd4 27.Fc5 a5 28.Fa3 Cf5 0-1(68) WJChess v1.64 -- Queen 3.04; 24.Df2 Tad8 25.Dxb6 axb6 26.c3 c5 27.a3 Rh7 28.Rc2 Te8 1-0(74) Little Goliath Revival -- Amyan 1.595. 23.c3 Cf4 24.Df1 Td7 25.Fc5 Dd8 26.Txd7 Dxd7 27.Td1 Dc8 28.Td2 a5 0-1(65) Patzer 3.61 -- Muse 0.899b. 23.Dh2 Cd4 24.Tf1 Cf5 25.Fc5 Da5 26.Rb1 Td5 27.Df2 Tad8 28.Tde1 T5d7 0-1(48) Frenzee 200 -- Dragon 4.6. 23...Da5 24.a3 Td7 25.Td2 Cd4 26.f4 Cf5 27.Df2 Cxd6 28.Txd6 Txd6 =-=(34) AnMon 5.50 -- Spike 0.9a. 26.Fxg7 Dxa2 27.b3 Cxg7 28.Df6 Ce6 1-0(63) DelphiMAX 2.9 -- Queen 3.04. 28.Txd1 Dxa2 0-1(79) Pharaon 3.2 -- SOS 5.1. 28.Rxd1 Dxa2 =-=(48) Ruffian 1.0.5 -- SOS 5.1. 21.Td3 a4 22.Fa3 Tab8 23.Ted1 Ff8 24.Cc5 Db6 25.Ce4 Fxa3 26.Dxb6 Txb6 27.Txa3 Tdb8 28.Txa4 Ce3 1-0(50) Glaurung 0.2.1 -- AnMon 5.50; 22...Rh7 23.Dd2 Db6 24.Fc5 Db7 25.Rb1 Tdb8 26.Dc1 Cf4 27.Tc3 Fxc4 28.Txc4 Cd5 0-1(89) Glaurung 0.2.1 -- SlowChess Blitz WV; 21...Cf4 22.Tb3 Dd7 23.Fxe6 Dxe6 24.Rb1 Td7 25.Df1 Tdd8 26.Ta3 Td5 27.Ta4 Dd7 28.Fe3 Dc7 =-=(61) Glaurung 0.2.1 -- Ktulu 4.2; 24...Td5 25.Df1 a4 26.Ta3 De8 27.Ff2 Dd8 28.Cc3 Tda5 0-1(68) Glaurung 0.2.1 -- Tao 5.6. 21.Dh2 a4 22.Td2 Tdb8 23.c3 a3 24.b3 Ff5 25.Ted1 Td8 26.Cd6 Txd6 27.Fxd6 Cxc3 28.Th1 Ta4 0-1(38) Patzer 3.61 -- Aice 0.92; 22...Dc7 23.Dg1 Tab8 24.Ted1 Da5 25.Ff1 Ff8 26.a3 Te8 27.Fxf8 Rxf8 28.Dc5+ Dxc5 =-=(95) Patzer 3.61 -- Hermann 1.3.5; 21...Tab8 22.c3 Dc7 23.Td2 a4 24.Dg1 Rh8 25.Ted1 Rg8 26.Ff1 Td7 27.c4 Dc8 28.Fa3 Ff5 0-1(36) Patzer 3.61 -- Sjeng 12.13; 22...Cxc3 23.Txd8+ Txd8 24.Cd6 Txd6 25.Fxd6 Fxc4 26.bxc3 Db5 27.Db2 f6 28.Dxb5 cxb5 0-1(63) Patzer 3.61 -- Arion 1.3. 21.Dd2 Tab8 22.b3 a4 23.Rb2 Da8 24.Df2 axb3 25.cxb3 Cf4 26.Fxe6 Cxe6 27.Fe7 Td4 28.Ff6 Da5 1-0(55) SOS 5.1 -- Pharaon 3.2; 22...Dc7 23.a4 Ff5 24.Df2 Fe6 25.Td2 Ff5 26.Ted1 Fe6 27.Rb1 Td7 28.Td3 Te8 =-=(108) SOS 5.1 -- Fruit 2.0. 21.Fxd5 cxd5 22.Cf6+ Fxf6 23.gxf6 Tab8 24.Fa3 d4 25.Txe5 Dc7 26.f4 d3 27.Txd3 Txd3 28.Tc5 Dd8 0-1(47) Yace Paderborn -- Zappa 1.0; 21...Txd5 22.Cf6+ Fxf6 23.gxf6 Txd1+ 24.Txd1 Fxa2 25.De3 Rh7 26.Dxe5 Fe6 27.Df4 Tb8 28.b3 Dc8 1-0(46) Yace Paderborn -- Little Goliath Revival. 21.a3 Tab8 22.b3 Dc7 23.Td2 Ff5 24.Ted1 Fe6 25.Dg1 Td7 26.De1 Dd8 27.Dg3 Ff5 28.Df2 Fe6 0-1(66) Patzer 3.61 -- Snitch 1.0.8. 23...Cf4 24.Fxe6 Cxe6 25.Ted1 Txd2 26.Txd2 Cd4 27.Rb1 Db5 28.Rc1 Cxb3+ 1-0(63) Spike 0.9a -- Tao 5.6; 24.Ff1 Td5 25.Ted1 Rh7 26.Cc3 Txd2 27.Txd2 Cd5 28.Ce4 Td8 1-0(86) Spike 0.9a -- Glaurung 0.2.1. 23...Rh7 24.Ted1 Dc7 25.a3 Da5 26.a4 Ff5 27.Fxd5 cxd5 28.Txd5 Tdc8 1-0(49) Spike 0.9a -- AnMon 5.50. 24...Rh7 25.a3 Da5 26.a4 Td7 27.Fa3 Ff5 28.De1 Tad8 1-0(52) Spike 0.9a -- SlowChess Blitz WV. 28.Dg1 Tb8 =-=(63) Spike 0.9a -- Ktulu 4.2. 21...a4 22.Dh2 Dc7 23.Df2 Db7 24.Dh2 Dc7 25.Dg1 Td7 26.Fa3 Ff5 27.Rb1 Tad8 28.Fc5 Db7 1-0(73) Booot 4.5 -- Sjeng 12.13; 25...Db7 26.Fa3 Dc7 27.Fc5 Db7 28.Fa3 Dc7 0-1(55) Booot 4.5 -- Snitch 1.0.8. 21...Td7 22.Td2 Tdd8 23.Ted1 Dc7 24.Df1 Tab8 25.Rb1 Ff5 26.Ra1 Td7 27.Fb3 Tbd8 28.De1 Cf4 0-1(64) Booot 4.5 -- Hermann 1.3.5; 22.Fa3 Tdd8 23.Cc5 Da7 24.Td2 Ff5 25.Ted1 Tab8 26.De2 Da8 27.De1 a4 28.Fd3 Fxd3 =-=(47) Frenzee 200 -- Nejmet 3.07. 21...Cf4 22.Fxe6 Txd1+ 23.Txd1 Cxe6 24.Fd6 Cf4 25.Dc2 Td8 26.Cf6+ Fxf6 27.gxf6 Db6 28.De4 Cg2 =-=(32) Booot 4.5 -- Patzer 3.61. 23.Fxe6 Cxe4 24.fxe4 fxe6 25.Te3 Db5 26.Tc3 Td7 27.De1 Tf7 28.Ff2 Tf4 1-0(51) Booot 4.5 -- Aice 0.92. 26.Db2 f6 27.Fe7 fxg5 28.hxg5 Rf7 1-0(137) Booot 4.5 -- Arion 1.3. 28.Te3 Ff5 0-1(58) Frenzee 200 -- Ufim 6.00. 21...Dc7 22.Td2 a4 23.Cc5 Ff5 24.Fd3 Fxd3 25.Cxd3 f5 26.gxf6 Fh6 27.Cxe5 Cxf6 28.f4 Cg4 0-1(73) Tornado 0.80.17beta -- Gaia 2.2a; 25...Cb6 26.Te4 Cd5 27.Tde2 Ta5 28.De1 Cf4 0-1(48) Tornado 0.80.17beta -- Adam 2.8a; 22...Tac8 23.Ted1 Tb8 24.Cc5 Ff8 25.Fb3 Ta8 26.Cxe6 fxe6 27.Fxf8 Txf8 28.Dc5 Tf7 0-1(67) Tornado 0.80.17beta -- Chispa 4.0.3; 22.Rb1 Cc3+ 23.Cxc3 Fxc4 24.Fc5 Db7 25.De3 Txd1+ 26.Txd1 Fd5 27.Td3 a4 28.Fd6 Te8 =-=(47) Pharaon 3.2 -- List 5.12. 21...a4 22.Cc5 Da7 23.Td2 Ff5 24.Fd3 Fxd3 25.Cxd3 Dxf2 26.Txf2 Cf4 27.Cxf4 exf4 28.c3 Te8 0-1(57) Tornado 0.80.17beta -- Arion 1.3. 21...Rh8 22.Td2 Dc7 23.Cc5 Fh3 24.Ted1 Ff5 25.Fxd5 cxd5 26.Txd5 Txd5 27.Txd5 Tc8 28.Dh2 Db6 1-0(70) Little Goliath Revival -- Zappa 1.0. 22.Fb3 Dc7 23.Fc5 Ta8 24.Fa4 Tab8 25.Rb1 Db7 26.c3 Da6 27.Ra1 Cf4 28.Fc2 Cd3 0-1(54) Pharaon 3.2 -- Fruit 2.0; 22...Da6 23.De2 Dxe2 24.Txe2 Cf4 25.Ted2 Txd2 26.Txd2 Fxb3 27.Fd6 Tb5 28.axb3 Td5 =-=(61) Little Goliath Revival -- Yace Paderborn. 22.Fxd5 Txd5 23.Cf6+ Fxf6 24.gxf6 Txd1+ 25.Txd1 Fxa2 26.De3 Rh7 27.Dxe5 Db5 28.Df4 Fd5 0-1(60) List 5.12 -- Fruit 2.0. 24...Fe6 25.Cc5 Db6 26.Cxe6 Dxf2 27.Txf2 fxe6 28.Tfd2 Te8 0-1(56) Tornado 0.80.17beta -- Madeleine 0.2. 28.De1 Cf4 0-1(48) Tornado 0.80.17beta -- Diablo 0.3. 21...f5 22.gxf6 Cxf6 23.Cd6 Db8 24.Dg3 Cd7 25.Fa3 Cf8 26.Rb1 Db6 27.Ce4 Txd1+ 28.Txd1 Tb8 0-1(54) DelphiMAX 2.9 -- Adam 2.8a; 24.Rb1 Cd5 25.Ce4 a4 26.c4 Cf4 27.Fd6 Da7 28.Dc2 Da5 0-1(86) Chispa 4.0.3 -- Adam 2.8a. 21...Cf4 22.Cd6 Db8 23.c4 Td7 24.Ce4 Txd1+ 25.Txd1 Ff5 26.Fb6 Fxe4 27.Td8+ Dxd8 28.Fxd8 Txd8 0-1(62) DelphiMAX 2.9 -- Gaia 2.2a; 22.Fd6 Fxa2 23.Cf6+ Fxf6 24.gxf6 a4 25.Fxe5 Txd1+ 26.Txd1 a3 27.b3 Fxb3 28.cxb3 Dxb3 0-1(48) Chispa 4.0.3 -- Gaia 2.2a. 21...a4 22.Td2 Cb4 23.Txd8+ Txd8 24.a3 Cd5 25.Dh2 Tb8 26.c4 Cf4 27.Fd6 Td8 28.Cc5 Db6 0-1(56) DelphiMAX 2.9 -- Chispa 4.0.3. 22.Txd8+ Txd8 23.a3 Cd5 24.c4 Cf4 25.Fe3 Ff5 26.Fb6 Ta8 27.Cd6 Dd7 28.Cxf5 gxf5 =-=(85) DelphiMAX 2.9 -- Madeleine 0.2; 25.Fb6 Ta8 26.Fe3 Db3 27.Dc2 Dxc2+ 28.Rxc2 Ff5 0-1(80) DelphiMAX 2.9 -- Diablo 0.3; 24.Fd6 Dd7 25.Td1 Ff5 26.Fc5 Dc7 27.c4 Fxe4 28.cxd5 Fxd5 1-0(58) DelphiMAX 2.9 -- Tornado 0.80.17beta. 22...Cd5 23.c4 Dc7 24.cxd5 cxd5 25.Cc3 d4 26.Ce4 Fd5 27.Dc2 Tdc8 28.Fh3 Fxe4 1-0(55) Chispa 4.0.3 -- Madeleine 0.2. 26.Dc2 a4 27.Td3 Dxc2+ 28.Rxc2 Fxc4 1-0(52) Chispa 4.0.3 -- Tornado 0.80.17beta. 28.Rxa2 Fxc4 =-=(30) Chispa 4.0.3 -- Diablo 0.3. 21...Td7 22.b3 Ff5 23.Cd6 Db8 24.Fxd5 cxd5 25.Txd5 Fe6 26.Td3 Ta6 27.Ted1 Td8 28.De3 Tc6 1-0(56) Adam 2.8a -- Madeleine 0.2. 21...Db8 22.c3 Db7 23.Rc2 Tdb8 24.Fa3 Ce3+ 25.Dxe3 Fxc4 26.Rc1 Fb3 27.Cc5 Db6 28.Td7 Fc4 1-0(64) Adam 2.8a -- Gaia 2.2a. 21...Cf4 22.Fxe6 Txd1+ 23.Txd1 Cxe6 24.b3 Cf4 25.Rb1 Cd5 26.Dd2 Dc7 27.c4 Cf4 28.Ra2 Ce6 1-0(50) Adam 2.8a -- Tornado 0.80.17beta. 21...Rh7 22.b3 Rg8 23.Fxd5 cxd5 24.Cf6+ Rh8 25.Txe5 Tdc8 26.f4 Fxf6 27.gxf6 Dc7 28.Fd4 Dd7 1-0(36) AnMon 5.50 -- Ktulu 4.2. 23.Td3 Rh7 24.Rb1 Tb7 25.Ted1 Db8 26.Dd2 Da8 27.Fa3 Tbd7 28.Cc5 Ta7 =-=(70) AnMon 5.50 -- SlowChess Blitz WV; 24...Db7 25.Td2 Cc3+ 26.Cxc3 Fxc4 27.Rc1 Fe6 28.Fd6 Txd6 =-=(44) AnMon 5.50 -- Tao 5.6; 23...Td7 24.Rb2 Db7 25.Td2 Tbd8 26.Fxd5 cxd5 27.Cf6+ Fxf6 28.gxf6 d4 =-=(34) AnMon 5.50 -- Glaurung 0.2.1. 23.Td2 Td7 24.Ted1 Te8 25.Fa3 Tdd8 26.Fb2 Rh7 27.Cc5 Fh3 28.Fxd5 cxd5 1-0(57) SOS 5.1 -- List 5.12. 23...Fc8 24.Td3 Fe6 25.Rc2 Cf4 26.Txd8+ Dxd8 27.Fxe6 Dd3+ 28.Rb2 Cxe6 1-0(67) Adam 2.8a -- Chispa 4.0.3. 25.Dd2 Db8 26.b4 axb4 27.cxb4 Tc8 28.Tb3 Td7 1-0(47) Adam 2.8a -- Arion 1.3. 28.b4 axb4 0-1(47) Adam 2.8a -- Diablo 0.3. 21...a4 22.Fa3 Dc7 23.Ted1 Tab8 24.Cc5 Ff8 25.Te1 Fxc5 26.Fxc5 Ff5 27.Ted1 Db7 28.Fa3 Tdc8 =-=(207) Muse 0.899b -- Snitch 1.0.8; 23...Ce3 24.Dxe3 Fxc4 25.Fd6 Dc8 26.Dc3 Fxa2 27.Fxe5 Txd2 28.Txd2 Fxe5 1-0(40) Muse 0.899b -- Sjeng 12.13; 23.Dh2 Db6 24.Fc5 Dc7 25.Dg1 Rh8 26.Fa3 Cf4 27.Fd6 Dc8 28.Fxe6 Dxe6 0-1(83) WJChess v1.64 -- Gaia 2.2a; 23...Ff5 24.Dg1 Cb6 25.Fd3 Cd5 26.Fc5 Tab8 27.Fc4 Td7 28.Ted1 Db7 =-=(95) WJChess v1.64 -- Adam 2.8a; 23.Cc5 Ff5 24.Fd3 Fxd3 25.Cxd3 Cb6 26.Te4 Cd5 27.De1 Cb6 28.Tde2 c5 =-=(60) Dragon 4.6 -- Ufim 6.00. 21...Cf4 22.Fxe6 Txd2 23.Cxd2 Cxe6 24.Fd6 e4 25.c3 exf3 26.Ce4 a4 27.Dxf3 Ta5 28.Dd1 Da7 0-1(62) Ruffian 1.0.5 -- List 5.12; 24...Db5 25.c4 Da4 26.Rb1 c5 27.Fxc5 Td8 28.b3 Dc6 =-=(63) Dragon 4.6 -- Nejmet 3.07. 21...Rh7 22.Fa3 Dc7 23.Cc5 Cf4 24.Cxe6 Cxe6 25.Ted1 Txd2 26.Txd2 Td8 27.Txd8 Dxd8 28.De1 Dd7 =-=(36) Ruffian 1.0.5 -- Pharaon 3.2; 23...Ff5 24.Ted1 Db6 25.De1 Tab8 26.Fxd5 Txd5 27.Txd5 cxd5 28.Txd5 e4 0-1(61) Dragon 4.6 -- Abrok 5.0. 21...Tdb8 22.Fa3 Db6 23.Dxb6 Txb6 24.Cc5 Ff5 25.Fxd5 cxd5 26.Txd5 Tc6 27.c3 a4 28.Ted1 Tcc8 1-0(64) WJChess v1.64 -- Chispa 4.0.3. 21...Dc7 22.Ted1 Rh8 23.Dg1 a4 24.Fa3 Ff8 25.Cc5 Tdb8 26.Te1 Ta5 27.c3 Da7 28.Cxe6 Dxg1 0-1(62) Dragon 4.6 -- Frenzee 200. 21...Cc7 22.Fxe6 Cxe6 23.Fd6 Da6 24.Cf6+ Fxf6 25.gxf6 Dc4 26.Rb1 Df4 27.Td3 Dxf6 28.Fxe5 De7 0-1(76) Muse 0.899b -- Hermann 1.3.5. 21...Rh8 22.Fa3 Dc7 23.Cc5 Ff5 24.Ted1 f6 25.Fxd5 cxd5 26.Txd5 Txd5 27.Txd5 fxg5 28.hxg5 Df7 0-1(57) Amyan 1.595 -- Zappa 1.0. 22...Ta8 23.Cc5 Dc8 24.Ted1 a4 25.De2 Ff8 26.Dxe5 Fd6 27.De2 Ff4 28.Fa6 Txa6 =-=(66) Muse 0.899b -- Arion 1.3; 24.Fb3 Ff5 25.Ted1 Dc7 26.Fxd5 cxd5 27.Txd5 Txd5 28.Txd5 Dc6 0-1(42) WJChess v1.64 -- Arion 1.3. 22...Dc7 23.Ted1 Ta8 24.Cc5 Ff5 25.Fxd5 cxd5 26.Txd5 Txd5 27.Txd5 Tc8 28.Rd1 Ff8 1-0(66) WJChess v1.64 -- Tornado 0.80.17beta; 23.Cc5 Fc8 24.Ted1 Db6 25.Cb3 Dxf2 26.Txf2 Ta8 27.Tfd2 Te8 28.Fxd5 cxd5 =-=(171) Muse 0.899b -- Aice 0.92. 22...Cf4 23.Cc5 Db6 24.Cxe6 Dxf2 25.Txf2 Cxe6 26.Fxe6 fxe6 27.b3 Td4 28.Th2 Tf4 =-=(149) Amyan 1.595 -- Yace Paderborn. 23.Ted1 Ff8 24.Cc5 Da8 25.De1 Fg7 26.Fb3 Rh8 27.Fa4 Rh7 28.Ce4 Da6 0-1(58) Amyan 1.595 -- Little Goliath Revival. 23...a4 24.Fxa4 Ff8 25.Cc5 Da8 26.Fb3 Rh7 27.Txe5 Fd6 28.Txf5 gxf5 1-0(42) Muse 0.899b -- Patzer 3.61. 23...Da8 24.Fd6 Tb7 25.Fc5 Tbd7 26.Fa3 a4 27.Fc4 Cf4 28.Ted1 Txd2 =-=(63) Ruffian 1.0.5 -- Fruit 2.0. 24...Fe6 25.Cc5 Db6 26.Cxe6 Dxf2 27.Txf2 fxe6 28.Tfd2 Te8 1-0(77) WJChess v1.64 -- Madeleine 0.2. 28.Fd3 Td4 0-1(65) WJChess v1.64 -- Diablo 0.3.